To celebrate the Billionaire Day, we have a special something for you!! S CLASS for the card and pendant is now RELEASED! Came from land of passion, Spain! Amazing Magician who will deceive your eyes! 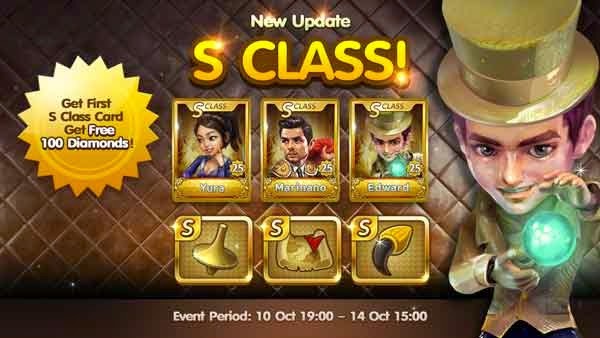 Tips Now the S Class already Released! So, this is the easier way to S Class and diamonds from this event. Just combine A+ card level MAX from the last event or new ones that you just upgraded to MAX. Tips The easier way to get S Class Pendant! Just upgrade your S Class Card to max level! You will get the S Class pendant of the Character for FREE! Or Random it from premium pendant gacha as usual. The Cool and Strong pendants are waiting to beat your friends with you! ﻿แค่นี้ก็จะได้การ์ด S สุดเจ๋งมา 1 ใบ แถมได้เพิ่มอีก 100 เพชรในระหว่างวันที่ 10 ต.ค. 19.00 - 14 ต.ค. 15.00 น.